Disabilities, and How SL Helps People blend in with Society, Lilly Lacewing Reporting. Disabilities, and Second Life, a match made in accessible heaven! Second Life doesn’t just blur the lines of discrimination when it comes to the disabled, it can completely eliminate the lines altogether. I know this from firsthand experience, which is why I chose to do this long ‘overdue’ assignment. In RL, I suffer from a rare, genetic connective tissue disorder, which to sum things up (otherwise this would BE the article,) it results in joints that don’t like to stay in place, pain, muscle spasms, and a host of myriad secondary systemic disorders. As a result, there are a lot of things I cannot do anymore in Real Life, but in Second Life? The possibilities are endless! I can ride horses again, climb hills and mountains, ‘walk’ through beautiful and serene landscapes without having to worry about my left hip staying in the socket. That being said, I’ve experienced people run for the hills when they approach me and strike up conversation, but you’ll be happy to know that those are the exceptions, not the rule. Most people are happy to talk to me, sick or not, because in SL what does it really matter? The beauty of the anonymity of places like Second Life afford those who get stared at in RL grocery stores, to go hiking with their best friends in a totally immersive way. Want to FEEL like you’re actually doing that hike? Go into first person view, and BAM! You’re there, hiking up the side of a pyramid! I took to the ‘streets’ in SL to see how others with disabilities have fared here in Second Life, and was lucky enough to come in contact with Brenda Brodie, a lady who finds joy in Second Life while dealing with Parkinson’s Disease in Real Life. 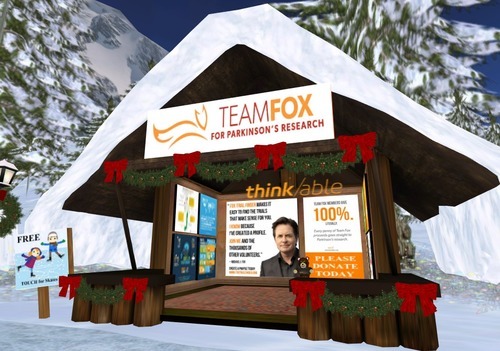 She is heavily involved with Fran Seranade who, with her daughter Barbie Alchemi, created Creations Park*, to support Team Fox and raise awareness for Parkinson’s. Here’s what she had to say. Brenda: I was diagnosed with Parkinson's disease 30 years ago, at age 37. I do very well considering the amount of time I have lived with PD. I live alone, drive a car, locally only. I cook, clean, etc. It takes me maybe 2 or 3 times longer than others to accomplish a chore, but I get it done and get it done right. (smiling) Of course, there are days when I cannot do much but I concentrate on the good days. I am told that I do as well as I do because I have a positive attitude and follow my doctor's recommendations for medication schedule. I also believe that the support from family and my acceptance of whatever comes to me in life helps me. I started writing poetry after being diagnosed with PD. Below you will find a sample which is from the heart. Brenda used to be a big fan of dancing, and riding her bike through the beauty of nature. When her body took that away from her, Second Life gave it back. She says she’s not personally experienced any actual discrimination, though people who didn’t know her have thought she was ‘drunk, because of all the typos and the slowness’ with which she types. At 87, she hasn’t let Parkinson’s win, and continues to fight it tooth and nail with happiness, positivity, and the help of her medications. I’m honored to have been able to meet Brenda, and to have her speak with me about Second Life, and how it can really be a benefit to those of us users who are disabled. People can’t discriminate against something they don’t even know is there, and I’ve found in SL, even when you tell them it’s there, most people don’t change. Only once have I personally experienced anyone walking away, and honestly, I’m glad for it. It was the type of person who hits on you when you have “I love my husband! !” smeared all over my profile, so it was no great loss. 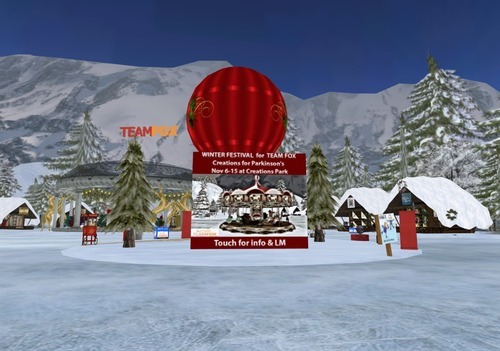 All in all, Second Life is a fantastic place for those with disabilities, for the freedom, socialization, and exploration it offers, not to mention all the artistic possibilities. I say, dive in! You won’t be disappointed!! NOTE: The Festival area on Creations Park will be left up for you enjoyment through December 31st. ♥ ♥ ♥Here at CREATIONS PARK everything we do comes from the love in our hearts. This event is about people sharing their talents to create something positive in our world ｡◕‿◕｡VIDEO Please be sure to watch our award winning video about the benefits of SL for our 88 "years young" RL Mom who has Parkinson's. This will touch your heart! Ebbe Linden (CEO of Linden Labs) has called this the most important video ever made about Second Life! Our RL family felt a desire to give meaning and purpose to the hours we spent in-world. Our dad died with Parkinson's and our mother, Fran Seranade, has it now. To quote her "I may have Parkinson's, but it does not have me." At 88 years young, she is active in Second Life and is thrilled to see herself running, and dancing again. Those of us in Second Life can have fun while knowing we are making a difference in the real world. 100% of all donations go to Team Fox for The Michael J Fox Foundation for Parkinson's Research. We believe it is important for you to know how your donations are being spent. Our family covers all tier and expenses so that all donations are given to research.